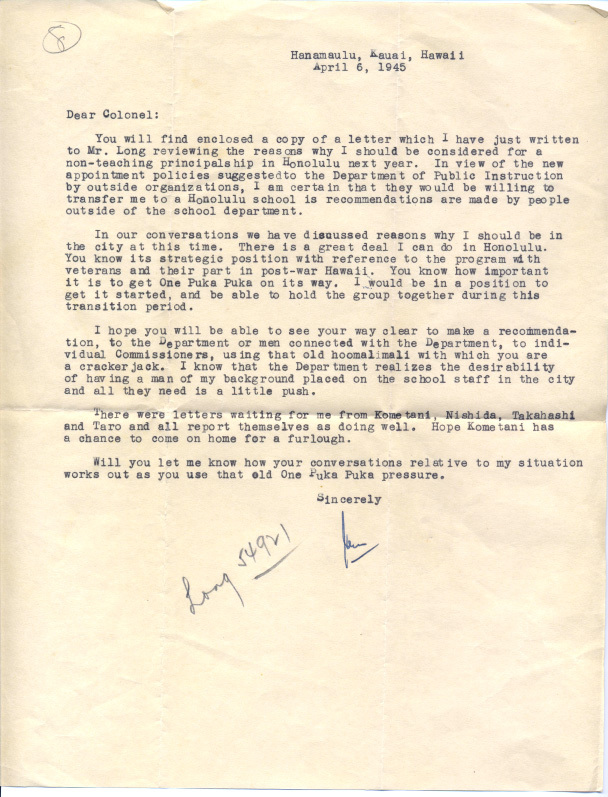 You will find enclosed a copy of a letter which I have just written to Mr. Long reviewing the reasons why I should be considered for a non-teaching principalship in Honolulu next year. In view of the new appointment policies suggested to the Department of Public Instruction by outside organizations, I am certain that they would be willing to transfer me to a Honolulu school is recommendations are made by people outside of the school department. In our conversations we have dismissed reasons why I should be in the city at this time. There is a great deal I can do in Honolulu. You know its strategic position with reference to the program with veterans and their part in post-war Hawaii. You know how important it is to get One Puka Puka on its way. I would be in a position to get it started, and be able to hold the group together during this transition period. I hope you will be able to see your way clear to make a recommendation, to the department or men connected with the Department, to individual Commissioners, using that old hoomalimali with which you are a cracker jack. I know that the Department realizes the desirability of having a man of my background placed on the school staff in the city and all they need is a little push. There were letters waiting for me from Kometani, Nishida, Takahashi and Taro and all report themselves as doing well. Hope Kometani has a chance to come on home for a furlough. Will you let me know how your conversations relative to my situation works out as you use that oId One Puka Puka pressure.